A fascinating thing I noticed in reading Hansen's book is how often Dr. Wayne Grudem was mentioned. He was not interviewed for the book but time and time again people who were interviewed brought up his name and books--especially his Systematic Theology (see pages 12, 97, 102, 116, 122, 125, 127). In that Dr. Grudem combines both a deep love for the Word of God and a deep passion for the power of God displayed in the full range of spiritual gifts it is no wonder that the neo-Reformed movement is displaying both of these tendencies. Dr. Grudem is not the only one who is manifesting this twin emphasis of Word and Spirit. I have already written about Sam Storms and his book Convergence: Spiritual Journeys of a Charismatic Calvinist (see here). Below are three more books seeking to combine a robust concern for the Word with an experiential role for the Spirit in spiritual gifts. 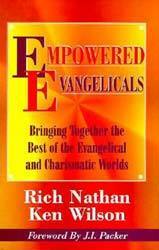 The first book is: Empowered Evangelicals: Bringing Together the Best of the Evangelical and Charismatic Worlds by Rich Nathan and Ken Wilson (Vine Books, 1995). This is a book that should not have been needed. But it is needed, and in some quarters quite urgently. It seeks to lead polarized people out of some tangles of negative and impoverishing opinion in which they are currently caught. One group sees the other as weak in the head, while the second rates the first as weak in the heart. Each forfeits some wisdom and maturity by declining to learn from the other. Wilson and Nathan are pastors, not devotees of either side but men with feet in both camps, and what they want to do is help these two sorts of Bible people to benefit from each other's insights and experience at the local church level. I applaud their venture. It would be a mistake to treat their upbeat, well-rounded presentations as implying that once their points are taken all problems are solved and all troubles are over, but following their lead will be a big step forward toward the unity in truth and power that our times oblige us to seek. They did not waste their talents when they wrote Empowered Evangelicals, and you will not be wasting your time when you read it. 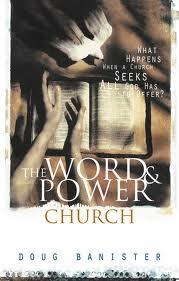 The second book is: The Word and Power Church: What Happens When s Church Experiences All God Has to Offer? 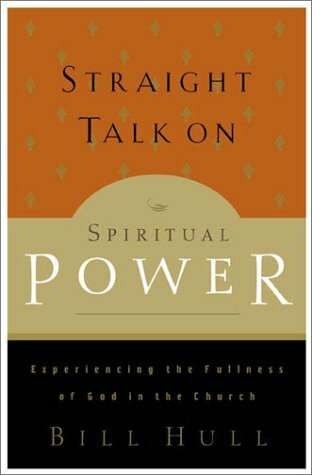 by Doug Bannister (Zondervan, 1999). Again, J. I. Packer endorses this book as well! 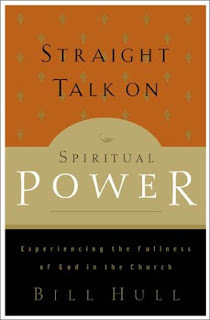 The third book is: Straight Talk on Spiritual Power: Experiencing the Fullness of God in the Church by Bill Hull (Baker, 2002). As I had observed in Florida the chasm between traditional evangelicals and evangelical charismatics is rapidly closing at the leadership level. But at the local church level, there is still cultural separation that is just as strong as any theological differences. I find there are more cessationists by custom than by study. Someone taught us that certain gifts and means of power are no longer active; therefore our church culture has been shaped around that teaching. The worship, the teaching, the praying, it all is slanted toward the cultural customs of the past. People's resistance is not theological. It is, however, a deeply inbred way of thinking. If the process of change affected only principles and logic, change would come a lot easier. Despite the baggage of our tradition, my desire for our church was to take them on a journey to experience all the fullness of God. But I knew that taking them on such a journey would require a great deal of prayer, team building, teaching, and patience. The evangelical church is divided into two groups: those who are focused on the Scriptures and those who seek spiritual power. The separation was never announced, just experienced. The Word-focused church gets periodic visitations of power, and the power church gets periodic visitations of the Word. For churches to continue like this is wrong. For me, the separation of my church from other bodies of believers became a matter of personal integrity. I believed, along with the pastoral staff and elders, that all the gifts of the Spirit are active and available to the church. It became clear to me that our practice and our beliefs were not consistent. We had treated the gifts of 1 Corinthians 12 like the crazy uncle the men in white coats came and took away years ago. We all know he is alive but we don't talk about him. I began to see the duplicity in our practice. God convicted me. God seemed to be saying, "If I have gifted my people for the common good, then why are you not teaching it? You are blocking the flow of my power. Why are you asking them to serve me without their tools and weapons?" The rest of Hull's book explains what he taught and how. He has a number of great discussions and is pastorally sensitive to the journey he was taking his congregation on during this time.